If you are planning a kitchen remodel, this is a great opportunity to create a space that works perfectly for you. So it’s important to avoid repeating any mistakes you may have made with your current design and layout. Take a good hard look at your existing kitchen. Analyze it in careful detail, with an eye toward pinpointing what works well—and what doesn’t work at all. You also want to do an item-by-item inventory and note how much you actually use each particular item. Be brutally honest here. If you are like most people, you probably have at least a few items in your kitchen that you rarely use, or perhaps have never used at all. Things that are commonly on this list include lazy Susan revolving cabinets, food processors, exotic cooking accessories and custom-designed shelves or cabinets. These items may all seem really exciting and cool, and may be interesting in theory. But in reality if you never use them, then they are just taking up valuable space. They are a waste of square footage and money. Don’t make the same mistakes twice by carrying over things in your new kitchen that weren’t put to good use in your old one. In a similar vein, think about the materials in your current kitchen. Again, pay particular attention to elements that seemed like a good idea at first but over time didn’t deliver the results you wanted. Fancy countertops and flooring materials may give your space a unique look, but if they can’t hold up to the abuse your family dishes out, they aren’t a very practical choice. Appliances are also an area where people often splurge on expensive choices they don’t really need. Pricey high-end appliances may be an appropriate fit for a gourmet kitchen, but if you mainly cook basic family meals (or perhaps rarely cook much at all), it’s probably financial overkill to spend a lot of money on appliances that provide more capabilities than you will ever use. 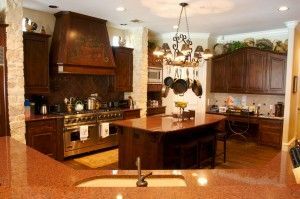 If you need some expert advice in choosing the best elements for your Scottsdale kitchen remodel, we’d be happy to help. At RW Remodeling, we enjoy helping our clients come up with the perfect plan for their new kitchen space.